Remove floating oil sheen and rainbow with SheenGuard pillows and blankets. SheenGuard pillows and blankets come in convenient standard sizes. SheenGuard blankets can also be custom designed. 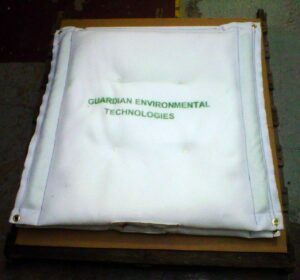 This is one of Guardian Environmental’s specialties. Specially designed and manufactured to prevent sinking, SheenGuard oil absorbent sheen removal pillows and blankets remain on the surface of water absorbing all traces of oil and sheen. Pillows can be attached together to form a larger surface area. SheenGuard pillows and blankets are built to last months under most conditions. Filled with our proprietary solidifying absorbent, PetroGuard-D, SheenGuard oil absorbent sheen removal blankets are made to your specific needs. The individual pillows may be clipped together to form an absorbent blanket of almost any practical length. 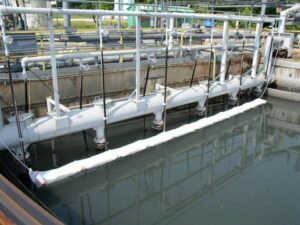 SheenGuard oil sheen removal pillows and blankets are ideal for use on industrial holding ponds and clarification ponds in combination with other intermediate steps prior to water discharge. They are also effectively used in place of a containment oil boom. Perfect for contained bodies of water such as shipyards, harbors, marinas and on-shore areas where the presence of standing oil sheen is likely to occur. SheenGuard blankets and pillows are constructed to the highest quality standards and are manufactured in the USA. Superior construction: custom fitted with additional flotation devices that insure stability in all conditions. Easy placement and reduced maintenance. Please contact us regarding a custom designed sheen removal blanket for your exact specifications and application requirements. Custom Constructed to your specifications. Note: The presence of surfactants can significantly affect the absorption capacity of this product. Please contact us for a quote for your application. Click here to read the Department of Fish and Game’s response to SheenGuard as an example of a product that meets environmental standards. Graphic depiction of a SheenGuard blanket being used to remove oil from inland water and tidal areas.